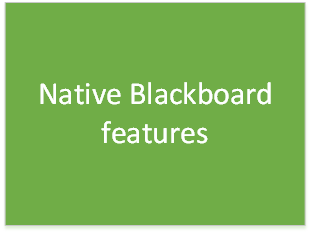 These are features which are core parts of the Blackboard product. Our elearning support site has step by step guides on how to use them. We provide direct support for them via ServiceLine and have a support agreement with the vendor who will help us to resolve any issues which we are unable to resolve ourselves. 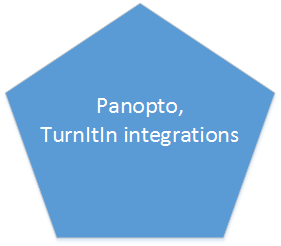 Panopto and TurnItIn are not part of the core Blackboard product, they are separate services which are integrated with Blackboard. These are centrally supported iSolutions services. Our elearning support site has step by step guides on how to use them. We provide direct support for them via ServiceLine and have a support agreement with the vendor who will help us to resolve any issues we are unable to resolve directly ourselves. 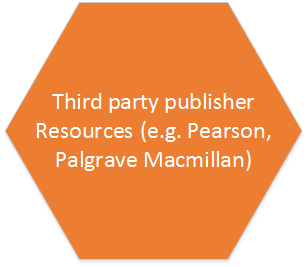 These are publisher materials purchased by faculties or individual subject areas that we have endeavoured to integrate into Blackboard. Support is handled by the faculties. Technical issues are forwarded to the vendor who will provide support on their own timeline. Freeware or open source plugins for Blackboard can provide beneficial extra features not included within the core product. Support for these is on a ‘best efforts’ basis. If the plugins are found to have security issues, incompatibilities, failures, or other issues which may cause system instability, they may be removed without notice. These instructions describe how to add Firefox to a Windows 7 UDE PC. 1. Look for the Additional Software shortcut on your desktop and open it. 2. Find Mozilla Firefox in the list that appears, select it by clicking on it. Note that the version number will change over time as newer versions are packaged for the University Desktop Environment. 4. Within a minute or two you should receive this confirmation message. 5. You should now be able to access Firefox from your Start menu. You can type Firefox into the search box to help you to find it.